Rendering of the new Statue of Liberty Museum. New York, NY The new Statue of Liberty Museum officially topped off when its final structural beam was raised in a ceremony on Liberty Island. Slated to open in 2019, the museum is designed by FXFOWLE, ESI Design, and DeSimone Consulting Engineers. This milestone was achieved little more than a year after the project broke ground. 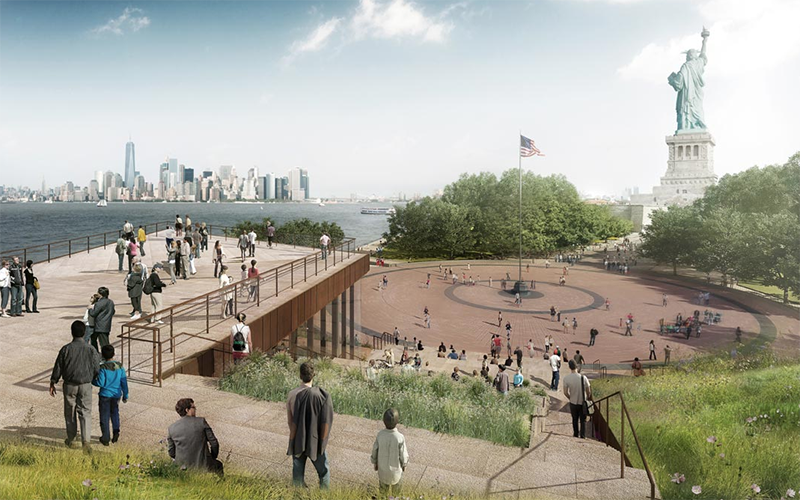 DeSimone Consulting Engineers, an engineering firm with offices worldwide, worked with FXFOWLE, the National Park Service, and the Statue of Liberty – Ellis Island Foundation to help create the new cultural facility. In addition to an indoor museum, Lady Liberty’s new 26,000 s/f center will include a sprawling outdoor plaza and a rooftop terrace with views of the Manhattan skyline. When completed, the structure is anticipated to achieve LEED Gold Certification. DeSimone Consulting Engineers has recently completed numerous award-winning projects in New York, including P.S. 62, NYC’s first net-zero energy school, the iconic Standard Hotel and New School University Center, as well as super-tall developments 220 Central Park South, 50 West, and 111 Murray. DeSimone was ranked as one of ENR’s top design firms and is recognized as a leading international structural engineering firm.